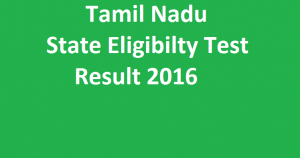 Results of Tamil Nadu State Eligibility Test has been Announced. Aspirants who have appeared for the Tamil Nadu State Eligibility Test examinations can check the Tamil Nadu State Eligibility Test results from the official website. Earlier, the Mother Teresa Women's University (Kodaikanal) conducted the examinations on February 21 across the state. Aspirants who have successfully cleared the examinations will be hired for the respective posts. Founded in 1984, Mother Teresa Women's University is located in Kodaikanal, South India. Mother Teresa university concentrates at women studies and also looks after the employment perspectives of young girls. Mother Teresa University also conducts examinations for recruitment in various departments.